Not even five goals would have saved Portadown tonight (Friday) at Seaview as league leaders Crusaders romped home by 6-0. The Ports arrived in Belfast aiming to cut the gap in second place from four points. However, the gulf at the final whistle proved more difficult to measure on a night that dealt Portadown’s title ambitions a major blow. Last weekend’s 5-5 draw against Ballymena United was celebrated within Irish League circles as an exhibition of entertainment. Friday’s Danske Bank Premiership clash proved a horror show as ruthless Crusaders brushed aside the side sitting second in the table. Darren Murray’s red card increased the agony for Portadown but Crusaders had already found the net on three occasions by 22 minutes. Murray could be facing a substantial ban for violent conduct. Pre-match concerns over how Portadown would deal with Crusaders’ aerial threat were highlighted on 10 minutes when Jordan Owens scored the first of his three goals. The Ports struggled to clear a delivery into the danger area and Owens took full advantage with a close-range finish. It was a similar story on 13 minutes when another ball from deep was headed across by Colin Coates and Owens smashed a shot into the net. The superb Paul Heatley made his mark with a glancing header on 16 minutes off a Richard Clarke cross. Portadown lost Murray to a red card soon after to increase the problems for the shellshocked visitors. The introduction of Tim Mouncey and Gary Twigg at half-time helped the Ports regain some control. However, Owens’ header off a pinpoint Heatley cross increased the gap to 4-0. Mouncey and Twigg combined to create an opening which ended with a sliding block on the latter’s shot. It proved a rare attack by the 10-man Ports. Heatley’s control and pace left Portadown on the backfoot again with a driving run that ended with a foul on Diarmuid O’Carroll that allowed the latter to increase the gap from the penalty spot. 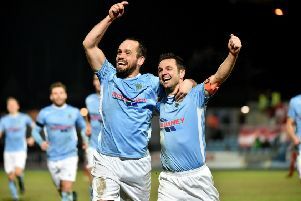 Heatley added the final insult by racing at the Portadown backline and steering an angled shot beyond David Miskelly. PORTADOWN: David Miskelly, Ross Redman, Chris Ramsey, Garry Breen, Peter McMahon, Sean Mackle, Darren Murray, Mark McAllister, Paul McElroy, Michael Gault, Robert Garrett. Subs: Billy Brennan, Tim Mouncey (on for McMahon, 46 mins), Gary Twigg (on for McElroy, 46 mins), Shea Conaty (on for McAllister, 63 mins), Jake Richardson. CRUSADERS: Sean O’Neill, Billy Joe Burns, Colin Coates, Joshua Robinson, Craig McLean, Barry Molloy, Richard Clarke, Declan Caddell, Gavin Whyte, Paul Heatley, Jordan Owens. Subs: Nathan Hanley, Stephen O’Flynn (on for Whyte, 72 mins), Michael O’Hanlon, Diarmuid O’Carroll (on for Robinson, 61 mins), Emmet Friars (on for Caddell, 74 mins).